​who passed away on Sunday, March 10, 2019. To see what the Sunday School is up to in 2019, go to the Sunday School page. Check out Ross Gladstone's song Hand in Hand - CANADA 150 which he has posted on YouTube. Click on the button to read the article in the June 3rd edition of The Chatham Daily News to get the whole story and the link to his song. ​at the age of 83. The 2016 Agricultural Service award was presented to our Charge treasurer, Brenda Gardiner, at the Highgate Fair. 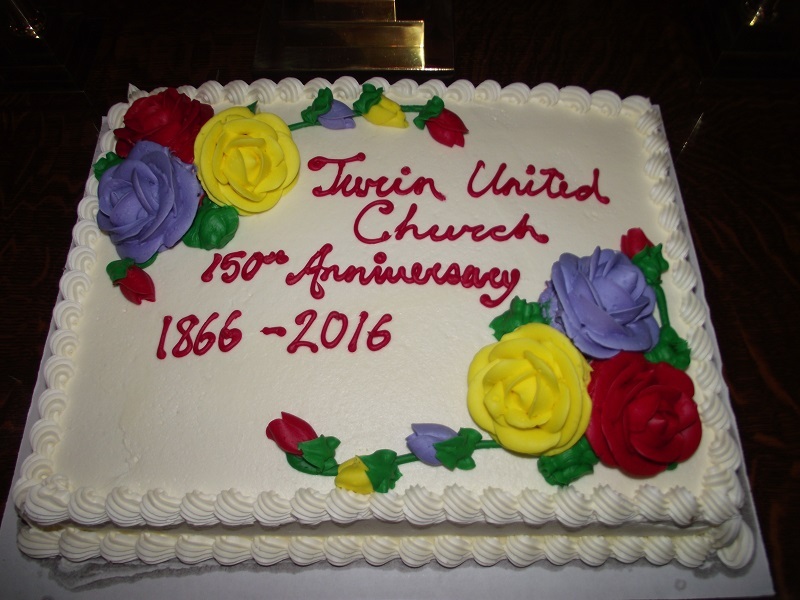 Turin United Church and UCW, has taught Sunday School and been a member of the Highgate Fair Board. There is special mention of her cherry pies and her first prize chocolate cake recipe. ​the Awards Day and Picnic, the Card-Making event, and Confirmation. 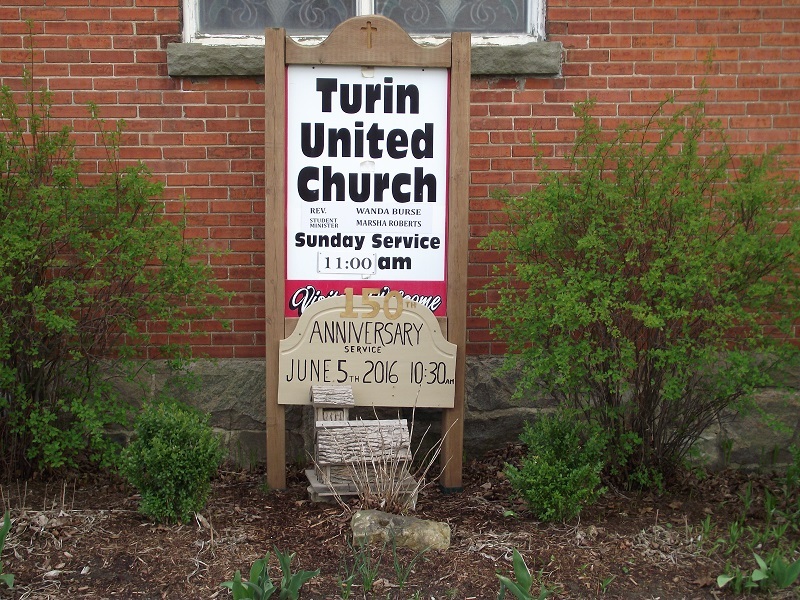 The update of the Turin United Church History Book is complete and ready for sale. If you are interested in a copy of this complete history from 1866 to 2016, please contact Brenda Gardiner. Nestled in a grove of Maples and Blue Spruce, towering over tidy fields of corn, soybeans and undulating green space, Turin United Church, situated at the intersection of two dusty country roads, has withstood the test of ages - 150 years to be exact – standing testament to the many generations of Christian families seeking a sense of community, faith and light within her walls. She has proven to be a tiny gem in an idyllic country landscape - the little church who proved she can! Her antique wooden doors were thrown wide open to welcome all friends, neighbours and families, past and present, wishing to witness and participate in a meaningful celebration of her 150th year of existence. Boasting a multigenerational congregation, church officials planned events for all tastes and ages. Sunday School children dressed in bright purple T-shirts labeled appropriately “Turin United Church” unofficially kicked off the service in a parade of flashy balloons, led by Allison Stirling, Sunday School Superintendent, and 11 dedicated teachers. Clerk of session, Bill Gardiner, welcomed over 250 guests who filled the church sanctuary - overflowing into the Christian Education room. Hand chimes rang out warmly – calling out to the spirit. Music Director and organist, Beth Gladstone, chose special music and invited several familiar musicians from our past - stirring pride and reflection in the church’s rich musical heritage. Roberta Dickson, former Turin organist, accompanied Beth on the piano. With Kirk Gardiner on guitar and Ross Gladstone on the violin, more musical voices were added to the spiritual mix. Vocal duets by Shannon Littlejohn Burnes and sister Caitlyn Littlejohn Goldhawk accompanied by their mother Cheryl Littlejohn with their close rich harmonies continued to showcase Turin’s rich musical tapestry. Ross Gladstone’s powerful solo “Holy Ground” was a reminder that those who do and have worshipped at Turin United Church are, indeed, standing on Holy Ground as we praise and worship His Holy name. Preparing her own personal liturgy the Reverend Wanda Burse led the service in worship. Guest speaker for the 150th Anniversary was the Reverend Graham Gladstone, Pastor at Langford Community Church near Brantford. His text was Ephesians 5:25-30. In his message, entitled “150 Faithful Years” he spoke of the church as Jesus’ Bride and the power of Faith that pulls those forces together. As a youngster, Graham was enthusiastically involved in Turin Church activities. At the conclusion of the service, members of the congregation took part in planting a white Oak tree behind the church. Shortly afterwards, in a dramatic response, timed perfectly, the heavens opened and a downpour of life-giving water bathed the tree’s roots. Who will seek refuge in its shade within the next 150 years? A delicious, full course dinner was then provided by the Turin United Church Women. After an excellent meal, guests could mingle or view an exciting collection of Turin memorabilia. Old photos, letters, historical records and historic hand-made quilts were of special interest. Available for sale was a book on Turin’s history from 1866-2016. It is an exciting, written account of our Faith journey –step by step -through 150 years. The Turin Anniversary provided a perfect setting for the happy reunion of families all of whom have ties to the church. In some cases, four generations of family members gathered to mark the special occasion. Mrs. Marie Hogg, the oldest church member at 101 years of age, enjoyed her visit with family and friends. Even the torrential rainfall could not dampen the spirits of those who came to celebrate Turin’s 150th. At this celebration of Faith, both body and soul were nourished with God’s great goodness. Please go to Turin 2016 in the Photo Gallery to see the slideshow. last service at Turin U.C.